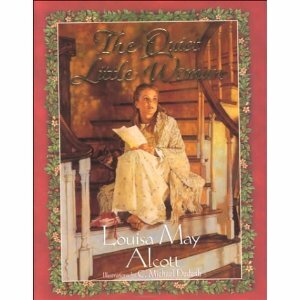 It was written by Louisa May Alcott. The illustrations by C. Michael Dudash are beautiful. When I got home with the book, I curled up on the couch and read through it. This is a story that Louisa May Alcott wrote for five sisters to include in their home-produced magazine. Alcott apparently wrote many encouraging letters to these sisters and wanted to write them a story for their publication "for love, not for money." The story itself was beyond beautiful, being about a young girl named Patty who had lived in an orphanage "ever since she could remember." "Oh, if someone would only come and take me away! I'm so tired of living here and I don't think I can bear it much longer!" Patty has a sad look about her and most people who would come to adopt or take away the girls from the orphanage passed over her. Patty longed for a regular home where she would be able to find and experience love. Eventually one day an older lady comes along and finds Patty sad and alone. She listens to Patty talk for a bit and arranges for her to move in with some relatives. The home is nice enough and the family mean well. However, they treat Patty more like a servant than a member of the family and Patty still longs to feel love. Through a particular set of circumstances, they come to realize that Patty is all heart and they learn to love her in a fresh, new and exciting way. The story, as you might imagine, ends well. Both the song and the story express the very same thing. Unfortunately, the book is now out-of-print although you can still find some reasonably priced used copies through Amazon. Naturally, I recommend the read. It's a short story but impacting just the same. Awe...and yes, that video is powerful. I know I have heard that title, but the story doesn't ring a bell -- either I've missed or or I read it eons ago. I'll keep my eyes out for it!